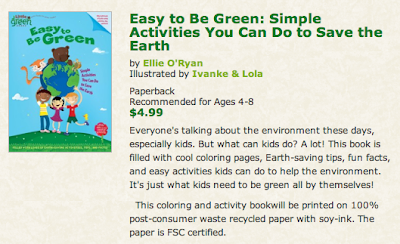 Little Green Books from Simon & Schuster has an eco-friendly series that I got to check out. The books teach about the benefits of recycling, how they can help endangered animals, and dangers of global warming, to name a few. Not only are the theme's environmentally friendly, but so are the actual books! They are printed on recycled materials with vegetable or soy inks. I think that is so great! And I also like how they are teaching kids to grow up to be earth friendly adults. This is Our World: A Story About Taking Care of the Earth also has a double sided puzzle! Now that my daughter is into puzzles she really gets excited about this book. Plus the story is cute and has a positive message. Don't Throw That Away! is a Lift-the-Flap Book and that's always a crowd pleaser at my house. Great book about recycling. Something I want to teach my children while they are young. I love how the girl in the story is a super-hero! Easy to Be Green is a great activity book! Lot of activities and coloring while learning. There is even one on how you can make your own reusable lunch bag. Such a great took to get your child thinking about reusing instead of just consuming. My First Garden is a book that you can also carry around with you by the handle. When we start gardening this year I'm sure my daughter will want to bring this along. Maybe as a reference so she can check to see if I know what I'm doing. My kids and I really enjoy these books, and I love having them around to help teach them about being nice to their planet. They would compliment any book collection for any kid. Little Green Books also has a page for Parents and Teachers with FREE downloadable activities! There's a maze, craft project, etc. You can also check out their blog for great posts like The Busy Parent Pesticide Guide. Little Green Books is giving ALL 5 Books to ONE Tight Wad Reader! 1. Leave a comment on this post stating which book from Little Green Books book list you're most interested in. Tweet/Facebook/Email about Giveaway - please include @tightwadinutah and link back to this post. Giveaway will end Thursday February 24th at 10 p.m. MST. Winner will be chosen by Random.org. I was given the above products to review. No other compensation was received. All opinions are my own. All information gathered for the giveaway will be discarded when over. Your privacy is important. I'd choose Little Monkey or The Adventures of a Plastic Bottle! These books are wonderful. I just finished a giveaway also. Id read the "Dont throw that away!" "Easy to Be Green: Simple Activities You Can Do to Save the Earth"
The Adventures of a Plastic Bottle or Little Panda is what I would chose!! My daughter loves monkeys so that would be our fav! I like My First Garden. These books are super adorable! I would love the My First Garden book. I'm interested in My First Garden! They all look like a fun way to teach our kids about taking care of our planet. "This Is Our World: A Story About Taking Care of the Earth" looks like a really fun one. I like the I Can Save the Ocean! : The Little Green Monster Cleans Up the Beach book the best. So cute. I have the little panda book. Little monkey would be cool too. I'm most excited about Little Monkey. I think my 3 month old would have lots of fun with it. Santa Claus Is Green! : How to Have an Eco-Friendly Christmas would be great for the holidays! I like the Endangered Animals book. I like "Little Monkey". The soft fleece appeals to me. I also like "The Adventures of an Aluminum Can". Too cute!! kristiedonelson(at)gmail(dot)com Thank you. I'd also like The Adventures of a Plastic Bottle. I'd like to read The Adventures of an Aluminum Can! I would LOVE the Little Monkey book! My son would be thrilled!! I'm liking The Little Monkey....cUtE!! I am most interested the "Don't Throw That Away! : A Lift-the-Flap Book about Recycling and Reusing". Little Monkey is my top pick. 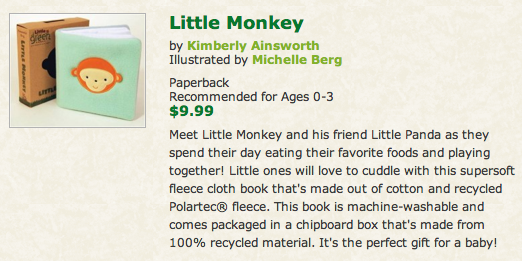 I'm most interested in Little Monkey - I think my baby would love it! like "My First Garden" because my little guy will be helping me in the garden this year and I think this book would be a great way to prepare him for it. Most interested in the Little MOnkey book! I like East to be Green! My first garden looks cute! I like My First Garden!